Can I Run With A Broken Toe? In this episode of the Doc On The Run podcast we’re talking about how to make sure that you get back to running as quickly as possible if you break one of your toes. The next time you get together with a bunch of your running friends just ask whether or not anyone has ever broken a toe. Chances are good that someone in the crowd will say yes. The most common culprit seems to be coffee tables. You’re walking through the living room barefoot and all it takes is to catch your toe on the corner of the coffee table and snap those little bones in two. The most obvious indication of a broken toe is pain. Bones bleed profusely under the skin when they break. So broken toes also tend to have a lot of bruising associated with them. That little piggy can also swell up and look like a sausage. So the most common outward signs of a broken toe are pain, bruising and swelling. If you have a swollen black and blue toe, there’s a good chance one of the bones in the toe may be broken. In the worst cases you may actually see some deviation on the toe. If the toe looks crooked, that is certainly a more ominous sign. Sometimes when a bone is completely snapped into two pieces, if you try to move the toe you may actually feel the two pieces of bone grinding together. The reason I decided this particular podcast this week is that at 8 o’clock last night I did a remote consultation for a patient who had a broken toe and wanted to get back to running. That discussion generated several thoughtful questions that I have heard before. These are all excellent questions for any injured runner. If you’re a runner and you break one of your toes you should not only think about these questions but you should also run these questions by your doctor if you’re trying to get back to running as quickly as possible. So we’re going to talk about all of the things that you should consider if you break one of your toes. What is the “Standard of Care” for a Broken Toe? In 2016 there was an article published in the medical journal, the American Family Physician which discussed treatment recommendations for broken toes. In that article, the authors recommended that doctors treat most broken toes with buddy taping and a stiff shoe for 4 to 6 weeks. These recommendations though are for little toes, not the big toe. Because I won a couple of different awards from the American College of Foot & Ankle Surgeons for research I did on fractures in the foot and ankle, I am often invited to lecture at medical conferences to teach doctors how to not miss subtle fractures and how to treat fractures in the foot. After having spent years lecturing to physicians on the topic, I can tell you for sure that the standard of care and the most common treatment recommendation from a doctor is to tape a broken toe to the toe next to it. In addition, a stiff shoe that prevents bending and limits movement of the broken toe will also be recommended in the overwhelming majority of cases. The third standard piece of medical advice is “ambulation as tolerated.” The problem of course is this is a treatment recommendation for relatively non-active, non-runners and when runners hear this advice they simply extrapolate that all that is needed is to tape the broken toe to another toe. Many runners then erroneously conclude that they can just tape the toe and continue to run. They also incorrectly think that if they do tape the toe it is going to probably heal in 4 to 6 weeks. When they hear, “ambulation as tolerated,” they also think they can run if they can walk, if they can tolerate it. There are a lot of false assumptions that seem to be made by runners. 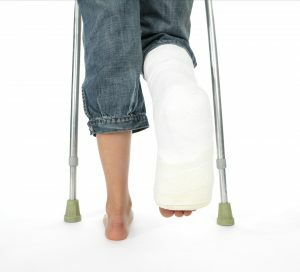 But if you understand a little bit about the types of broken toes and the basics of fracture healing, you may be able to make better decisions about treating a broken toe so that it will heal as fast as possible and get you back to running as quickly as possible with the lowest chance of developing a persistent problem. All broken toes are not created equal. In fact, doctors have several different ways of classifying broken toes to determine whether or not a certain treatment may or may not be necessary. But if closed reduction fails, the doctor may recommend surgery to realign the bone. In many cases a small pin or even a tiny little plate with some screws are used to stabilize the fractures. Doctors call this procedure “open reduction with internal fixation” (or ORIF). It is terrible to have surgery, but there is an advantage to surgery. The fractured bone that has been stabilized with internal fixation won’t move. That inherent stability following surgery allows for earlier mobilization and an earlier return to activity. In theory, you could run sooner with less risk of developing a non-union. But that’s just theory. The ends of the bone are covered with cartilage. So when a doctor talks about the articular surface, she is really just talking about the joint. When a doctor tells you that you have an intra-articular fracture of the toe what that means is that the fracture line has extended all the way into the joint and may have disrupted the cartilage. If the doctor says you have an extra-articular fracture then there is no involvement of the joint surface or the cartilage within the joint. If the fracture line extends into the joint, it is a lot more serious. The concern is that an irregular joint surface will be more likely to develop arthritis in the future. If the fracture is displaced and the joint surface is crooked then this is almost certain to damage the joint surface and function itself. The concept isn’t hard understand. If you have a jagged piece of broken bone sticking into the joint it’s just going to wear out the cartilage much faster than a normal joint surface. The common recommendation for primary care physicians evaluating broken toes is to refer any intra-articular fracture to a foot surgeon. But that doesn’t mean all intra-articular fractures of the toes need surgery. When I see patients who have intra-articular fractures of the toes, I almost never do surgery. However I can tell you that I use to do surgery on broken toes a lot more frequently than I do now. If you have displacement and a fracture line that extends into the joint, it’s pretty easy for the doctor to justify surgical intervention. Doctors also get paid a lot more for treating broken bones surgically than they do for treating fractures without surgery. But here’s the way that I think about it now that I have a practice focusing primarily on runners. The real question isn’t whether or not surgery might reduce the risk of problems down the road. If you don’t have surgery to realign the joint and you develop pain later, the treatment is most likely going to be surgery. The later surgery is to remove the broken piece of bone that is causing the damage and pain within the joint. I have treated thousands of runners. I have treated hundreds of broken toes and out of all of the broken toes I have treated without surgery, I have only had one that had to go to the operating room later because the fracture healed in a position that was causing pain and limiting activity. One. Only one. The way I think about this is that since the overwhelming majority of these fractures heal and the runners get back to running without surgical intervention, it seems kind of foolish to simply take everybody to the operating room to cut the toe open, pin the bone and then sew up the toe, when it seems incredibly unlikely that they will have pain if we don’t do surgery. Another consideration is the amount of angulation of the bone. If your doctor tells you that the fracture is “angulated” it just means the bone is tilted at the fracture line. In most cases this implies the bone is together in one area and pulled apart at the other end of the fracture line. Angulation of broken toes is fairly common, but it may not be a real problem. A number of medical journal articles say the patient should be referred to a foot surgeon if there is an angulation of more than 20° either up or down direction, or 10° in the right or left direction. But if you look at the toe and the toe appears to be basically straight, it seems difficult to justify performing surgery just because there’s a little bit of angulation visible on an x-ray. If your doctor tells you that you have some angulation in the toe and you may need surgery to realign it, the primary question you should ask your doctor is whether or not the doctor really and truly believes that surgery will be necessary to get the toe to heal. You should further explain to your doctor that your primary goal is to heal as quickly as possible so you can get back to running. If she thinks you need surgery the important follow-up question is, “But what if it takes a couple of weeks for the swelling to go down and then get to the operating room?” The healing doesn’t begin until the surgery is over. So if it takes a week or two to get the surgery, the advantage of healing after surgery may be diminished by the time it takes to get through the surgery. An open fracture is where the bone sticks out through the skin. A closed fracture is the more common variety. Most of the time when you kick something and break the toe, the skin doesn’t split open. But just because this sounds dramatic, it does often happen in ways that are not interpreted as classic open fractures. One of my close friends actually caught his little toe on a coffee table one day. He did break the toe. But worse, he actually kicked the table so hard as he walked past it that the skin at the bottom of the toe split open like an over-ripe tomato. Being a relatively tough guy, he didn’t think that much about it. He bandaged it up and went on his way. A few days later his wife actually called me because she was concerned about it. When I saw it, we got an x-ray, the toe was indeed broken but because the skin was split open technically it was an open fracture. The problem with this is that any communication between the outside world and a broken bone can easily infect the bone. In fact, there is an entire classification scheme of fractures in the foot and ankle which deems any open fracture that has been exposed for more than eight hours to proclaim that the bone must be infected. Bone infections are serious business. Although they can sometimes be cured with high doses of intravenous antibiotics, they often lead to amputations. So unless you intend to transition from the age group category to the challenge athletes category, you would be better off making sure you don’t ignore an open fracture. The most common source of open fractures in the toes probably is a smashed toenail. The distal phalanx (or the little bone at the end of the toe) is right underneath the toenail. So many times when people kick something hard enough to break the bone, they also smash the toenail. If the toenail becomes loose and falls off, the nail bed underneath the toenail gets split open, you may have an open fracture. If you think you might have a broken toe and you have any damage to the toenail or any split in the skin that produces any bleeding whatsoever, it should be considered a medical emergency! But back to the standard broken toe. Whether the toe can be treated with simple interventions like taping or something more complicated like surgery the important thing is to make sure that it heals. If the broken bone never heals, you can end up with chronic pain, persistent swelling or a deformity in the toes that interferes with your ability to run down the road. Most doctors will tell you that you should not run with any type of fracture, even a broken toe. 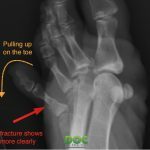 But I personally believe that whether or not you should run with a broken toe depends upon the severity of the fracture and how much inherent stability there is in the toe and that inherent stability changes throughout the course of healing. Do I need to wait until the toe completely heals before I run? But before you can answer that question you have to define what complete healing actually means. To some people, “complete healing” means that the pain goes away. To some people “complete healing” means that the bone looks totally normal on an x-ray. But that can take a long time. In fact the remodeling process that continues to evolve after the bone has gone through its initial stages of healing can take up to 18 months. So if you’re very pessimistic you might actually think that the healing process takes 18 months. There’s no way that I would expect a runner to stop running for a year and a half while their waiting for a little toe to heal! 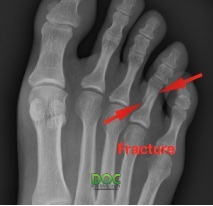 When I think about healing a fractured toe, I think if bone is in a good position, it it’s stable and if there is enough calcium bridging the fracture site so that it’s stable enough to withstand normal activity, you can probably start running. All things being equal, if you’re young, healthy, you don’t smoke, you have good blood flow, good nutrition, and the ends of the broken bone are very close together and very stable, I would expect it to heal in about six weeks. This of course assumes that you’re doing something externally to stabilize the toe and prevent the motion that can slow fracture healing. Should I wait another couple of weeks before I start running? No one who is an athlete wants to sit still and even when there’s a broken bone, nobody is happy about taking time off from running. Not running makes me grumpy. If I take off running for a few days, my wife seems to know it. If I take a few more days off of running, my friends don’t want to hang out with me. In fact, I don’t even want to hang out with myself! 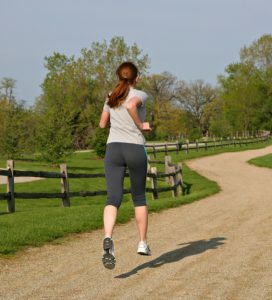 I personally believe that you should get back to running as quickly as reasonably possible. But you have to let the toe get some inherent stability through the healing process before you can run on it without risk of re-injuring the toe. There are a couple of ways to figure out whether or not the toe is stable enough to run. The most common, but least reliable assessment tool is probably x-rays. The reason I say x-rays are unreliable is that the soft callus that forms between the two ends of bones and can produce the initial stability, it is there stabilizing the bones, yet the callus doesn’t show up on x-rays. You may see some secondary signs of the callus formation but you can’t really tell just by looking at an x-ray how stable the fracture is. So when the doctor looks at your x-ray and sees a gap between the two bones, she may simply tell you that the bone is not yet healed. But in reality, there may be enough collagen formation between the two pieces of bone that it’s actually relatively stable. It may even be stable enough to run. If your doctor is thoughtful about the physical exam she can push and pull on the fractured toe and assess whether or not there’s enough inherent stability that you might be able to run. In fact, I often walk patients through this process when I do remote consultations for them. I simply explain the process of manipulating the toe so the runner can tell whether or not it is painful when it’s pushed or pulled in certain directions. We can talk about how tender or painful these manipulations are, and how that relates to which stage of fracture healing they’re in. Based on that interaction, the runner can then figure out whether or not it’s really safe to start increasing their activity level to the point of running. Are there any particular running shoes that can help stabilize a broken toe when I run? The best shoe for a broken toe is a fracture walking boot. The reason fracture walking boots work so well is that they keep the foot and ankle completely still. Fracture walking boots also have a curved sole referred to as a rocker sole. A rocker sole prevents bending of the toes when you walk. So when you are wearing a fracture walking boot you are basically rolling across the rocker sole instead of bending the toes and pushing off with the foot. Obviously, you can’t run in a fracture walking boot. A surgical shoe is a lighter weight version of the fracture walking boot. The surgical shoe is also fairly stiff and it has a slight rocker sole. Although it is not as stable and does not prevent as much motion in the foot, it still does a great job at offloading the forefoot and decreasing the motion in the toes. Many doctors recommend surgical shoes instead of fracture walking boots for patients with broken toes. Although a “surgical shoe” sounds like a fancy piece of medical equipment, it is actually a really cheap, poorly made piece of footwear. In my opinion, Dansko clogs work just as well as surgical shoes, if not better, for a broken toe. Clogs are stiff and they have a very steep rocker under the forefoot. Many patients with broken toes can slip on a Dansko clog and walk without any pain at all. Of course, it’s not easy to run in a clog. Hoka running shoes are likely the shoe I recommend most to runners with broken toes. Hoka’s, which are commonly referred to as “maximalist running shoes,” are not just big bulky running shoes. Hoka’s have an active foot frame built into the shoe that makes the forefoot very stiff. Hoka running shoes also have an aggressive rocker. That combination of forefoot stability and forefoot rocker sole, provides an excellent shoe for returning to running after a fractured toe. There are very few shoes that can limit motion in the toes when running as well as Hoka’s. Is it better for me if I wait a few extra weeks, just to let the toe completely heal? Nothing’s free in medicine. For every benefit there is a risk. For every good thing, there’s a bad thing. For every plus there’s a minus. Even not running. you that you have to stop running to recover, but that’s not always true. The thing I tell runners, that they have to keep in mind, is they should get back to running as quickly as possible. There is a risk with not running. If you don’t run, you’re actually going to get weaker, stiffer, and you will start to lose your neuromuscular connections that facilitate good running form. Then, when you finally get back to running, you are unfortunately at a higher risk of developing recurring running injuries. So in that respect, sitting on the couch for a runner is risky business. The most important thing you can do is find a doctor who will help you with early assessment in the stages of healing and if your doctor seems to have a cookie-cutter approach to fracture treatment and doesn’t want to bend on getting you back to activity, then you might want to look for a doctor who specializes in running injuries. If you can’t find one locally, you can always arrange a remote consultation second opinion with a running injury expert. Which x-ray view are best for a broken toe? Most doctors will either order two views or three views of the foot when they’re suspicious that you have a broken toe. In general, the more views, the more information the doctor will get from the x-rays. The three standard views are the Anteroposterior X-ray (AP), Medial Oblique X-ray (MO), and Lateral X-ray. The anteroposterior view is the one you get if you’re taking x-rays from the top of the foot. If you are standing upright and you look down at your bare feet while standing on the floor, this is the view that you would get if you had x-ray vision and could see all the way through your feet. If you then keep the inside of your foot, big toe and arch on the ground and you slightly pull your little toe up off of the ground and then take the x-ray, this would be the medial oblique view. The lateral view is the side view of the foot. The lateral x-ray is one of the standard three views, but there’s so much overlap with the toes that it’s very difficult to assess a fracture in any of the bones in the toes on this view. Some x-ray technicians will wrap a piece of cloth bandage material around the one toe that is suspected to be broken and then pull upward and take the x-ray. When they do this, it reduces the amount of overlap of the bones in the neighboring toes. This gives a much better view of the bones in that one particular toe that is pulled up away from the other toes. The problem with this view is that pulling hard on the toe can move the fracture out of position. 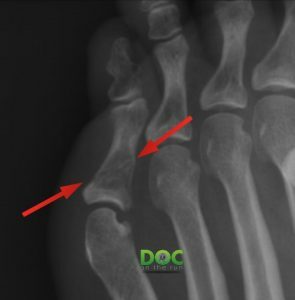 If this view is performed when the toe is partially healed, but still relatively unstable, just taking this x-ray can disrupt the healing process and cause a setback. Although I will readily admit this view can be very useful in assessing the fracture, I don’t often order it simply because I believe it is risky to pull so hard on the toe. The last thing that you want as a runner is to realize that just by getting an x-ray to evaluate your state of healing, you may have actually set yourself back by pulling apart some of the healing and maybe even resulted in you losing a couple of weeks of progress. How long will it take before the toe fracture line completely goes away and the bone looks normal on the x-ray? 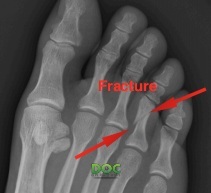 Medial Oblique X-ray (MO View): displaced fracture in the 4th toe. You have to realize that fracture healing is a very long process. The bone will change overtime. The appearance of the fracture on x-rays also changes overtime. If there is any displacement or angulation of the fracture, it is entirely possible that there’ll be some gap visible on x-rays for months or years. But just because there’s some irregularity visible on the x-rays, it doesn’t mean you can’t run. The important thing is to make sure there is some strong bony healing across the fracture line. The bony healing bridges the fracture and makes it very stable. So in most cases, if there is even a small amount of bony bridging across the fracture site, I will let the patient run. Should I get follow up x-rays to make sure that the toe is completely healed before I run? 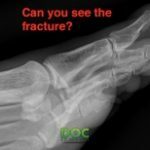 If you are extremely paranoid, anxious or nervous, you may feel better getting an x-ray and getting visual confirmation that the fracture has healed sufficiently before you start to run. But x-rays are not always necessary. In fact, I had one patient who actually broke both of her heel bones and I let her run without any follow-up x-rays at all. We just did not feel they were necessary given all of the clinical indications of healing. All the information I got from her exam when I looked at her and poked and prodded on her foot suggested that her fractures had fully healed. All of us want a concrete answer. Most runners want reassurance. But an x-ray won’t always provide the assurance you desire. In some cases, a small gap or some small irregularity can unnecessarily hamper your return to running. So if you have any small x-ray abnormality, it’s essential that your doctor takes that as a component of the bigger picture to determine whether or not it’s actually okay for you to get back to running. Again, you may have enough collagen and early bone healing that the toe is actually stable enough that if you just tape the toe to the toe next to it and also wear some relatively stiff rocker soles shoes like Hoka’s, you may be able to run even if the bone doesn’t look completely healed on the x-rays. When I start running how can I tell if I am doing any damage? Once you’ve decided that it’s okay to start running, it’s crucial that you are constantly evaluating the situation. If your doctor told you it is safe to start running but the toe hasn’t completely solidified on the x-ray, you have to be very careful. But there is a way to tell whether or not you’re doing any damage. The first indication of a problem is pain. Although we often think “no pain no gain,” this isn’t true with fractures. Ongoing pain is a bad sign. If you go for a run and it hurts with every step, you’re probably damaging the fracture. Even if it only hurts a little bit while you’re running, if you have throbbing pain later in the day or that evening, that is also a sign you did way too much activity. You may have even disrupted some of the healing that has already taken place. But pain isn’t the only sign of trouble. Swelling is one of the best ways to determine if you’re moving the fracture too much because the toe is a relatively small structure, the change in swelling can be subtle. Every runner I know has a cell phone that takes pretty good pictures. So put your foot in an area of even light and take a picture. Then, after you run take another picture and then blow up the picture on your computer to see if you can tell any difference between the amount of swelling. You can even take another picture the next day and compare again. If you see an increase in swelling after you run, then you may be pushing the activity just a little too much. The very worst outward sign of damage is bruising. If you’re running so much that you are disrupting the healing and moving the ends of the fractured bones they could start to bleed. That bleeding seeps under the skin and causes the discoloration you recognize as a bruise. If you see any bruising at all, you definitely did too much activity and may have disrupted the healing process. Anytime you have a broken toe that is healing but starts to become bruised again, you should get it evaluated right away. What is the safest return to running routine after breaking a toe? As we’ve implied many times here, motion is the enemy to a healing fracture. Running is the epitome of motion. But we’re really worried about the motion in the toes. Irregular motion, such as pushing off at an angle, or when changing direction is the most stressful. So do everything you can to eliminate the variables that can abnormally load the toe and lead to disruption of the fracture healing. Run on flat ground. Avoid hills, and obstacles. Don’t run where you know you’re going to have to dodge tiny dogs on long, nearly invisible leashes. Don’t run on rough irregular trails. The safest routine is to run on the track. Start out by running the straits and walking the curves. If that feels okay, then try to run a mile or two. But don’t go far. In your initial outings keep the runs extremely short. Don’t really think of it as a run. Think of it more as an assessment or evaluation to determine whether or not it’s really safe for you to be running at all. During this period you’ll have to fight the temptation to compare your current runs with your prefracture levels of fitness. You have to remember that you are already trying to push the limits just by running early in your recovery. So be easy on yourself. Don’t let your ego screw things up. Running in a different direction on the track will place different forces on your right foot versus your left foot. If the fracture is on one of the little toes on your right foot then it safe to run in the normal direction on the track. Just pick whichever lane makes you most comfortable and run in the standard counter-clockwise rotation around the track. If the fracture is on one of the toes of your left foot then you’re better off running in the opposite direction. If you run in a clockwise rotation around the track, there will be less force on the toes of your left foot as you round the curves. Is it okay to walk around the house barefoot if you break a toe? If it’s been a few weeks since you broke a toe and it’s starting to feel much better, it is sometimes better to start to loosen things up by walking around the house barefoot. Of course, you have to remember that the toe is relatively unprotected when you are barefoot. So if you tape the broken toe to the toe next to it, you add a little external stability to your barefoot routine. Walking around the house barefoot, you’ll get more natural motion occurring throughout the foot. This will reintroduce some much-needed flexibility. But you have to be careful to avoid obstacles. Be careful around transitions between flooring surfaces, the edges of carpet and watch out for any toys that might be left on the floor by your kids. The last thing you need is to trip over something and re-break the toe when you’re already well on your way to healing. Isn’t it better for me if I just take a few more weeks off and let it completely heal before I start running? What is the risk of a few more weeks in the fracture walking boot? This takes us back to the original idea of whether or not you can really run with a broken toe at all. You have to decide what you’re trying to do. Are you just trying to heal a broken bone, or are you really trying to get back to running? If you’re just trying to heal the fracture then you should keep the boot on as long as possible. No motion promotes healing of fractures. So if healing the fracture is the primary goal, it follows that you should protect the foot and let the bone heal. This is what most doctors promote. But if the goal is to run, don’t focus on the fracture. Focus on fitness. The longer you are wearing the fracture walking boot, the longer you are immobilized in a cast, the more time you spend on crutches, etc., the more risk of developing a series of chronic, recurring running injuries. Inactivity and immobilization are killers for athletes. The ideal circumstance is to find the perfect balance between your current state healing and the equivalent permissible activity level. To accomplish this, you have to work closely with your doctor to determine where you are along the healing continuum. If you work with a doctor who specializes in running injuries you can work together to make sure that your stage of healing is appropriately matching your activity level to ensure a rapid return to running.